If you are at all into steampunk, then you’ve probably heard of Outland Armour, or seen some of their crew at conventions. 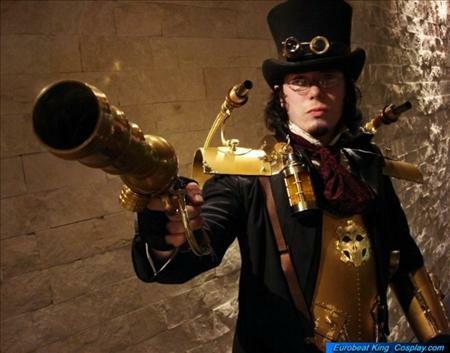 In fact, this picture (right) of “Dante” from Outland Armour shows one of the most recognized steampunk costumes on the internet. Sadly, Outland Armor was in Tennessee during the floods, attending the MTAC convention. The hotel they were staying in has been condemned, and they are not allowed to retrieved any of their items from their hotel room. It could be weeks, or months, before they ever see those things again. This includes several of their iconic costume pieces, including their steampunk Boba Fett and Darth Vader. Even worse is that their bus, which had product for sale and materials in it, and four personal vehicles were completely submerged. They have no way of getting to them. They are apparently going to be towed to a lot for the insurance adjusters, but even then there’s no telling when Outland Armour will get to examine them. As expected, Outland Armour was one of the vendors scheduled to appear at The Steampunk World’s Fair next weekend. They are reassuring fans that they will be attending, but they aren’t sure how many of them, and with how much product. Some had not been brought to MTAC in the first place, so there is some they have access to. In order to try and recoup their losses, Outland Armour has set up a ChipIn site, at the behest of their fans, to try and raise money to replace their bus. Estimates on their losses are incalculable at this point. They will not be getting any FEMA assistance since they are not a registered company and the items that were have lost are either already covered by car insurance or they were items that aren’t considered things necessary to survive (pretty much all of their gear). You can read up on further details of their plight, as well as donate, here: Outland Armour Flood Relief. As of this posting, they’ve raised $800 from 25 contributors.